Agnieszka is in a coma. She fell into it as a result of a car accident. She is 24 years old... get to know her story. TV REPUBLIKA REPORTAGE "TRAPPED HOPE"
Just 12 months ago my sister Agnieszka was a strong and full of life girl, with enthusiasm bringing to life her goals. When, after three years of studying in London she informed us that she’s coming back home, we were very happy. Now, however, I think it would have been better if she had not returned to Poland ... December 12th 2014, Friday, that day the fate mocked her dreams and plans, and our world was immersed in overwhelming grief. Now our life is divided into two parts - before the accident and after the accident. Before the accident, my younger sister Agnieszka Holka was an incredibly cheerful, sporty and beautiful, exceptional girl, full of dreams and with many talents. She spent nights and nights writing novels, dreaming that one day she is going to be discovered. She sang and played the guitar. Every week she met with a group of friends to play volleyball. She loved cycling and swimming. After graduating from high school she studied Veterinary for one semester in Lublin. After passing all of her exams she took a dean’s leave because Veterinary Medicine was not giving her the feeling of 100% satisfaction, and it was extremely important to her. She was never afraid of challenges, which is why she went to London – beforehand she applied for studies: Media, PR and Advertising at Middlesex University of London. As an 18-year-old she took a loan to pay for her studies on her own, and took up a job in London. She was able to reconcile studies with professional duties, while simultaneously finishing touch typing, and Office use computer courses. With such a heavy load she still was capable of gathering a faithful circle of friends, who to this day, inquire about Aga’s state, and support us in many initiatives. She has spent almost four years away from home. Several months have passed since the accident. 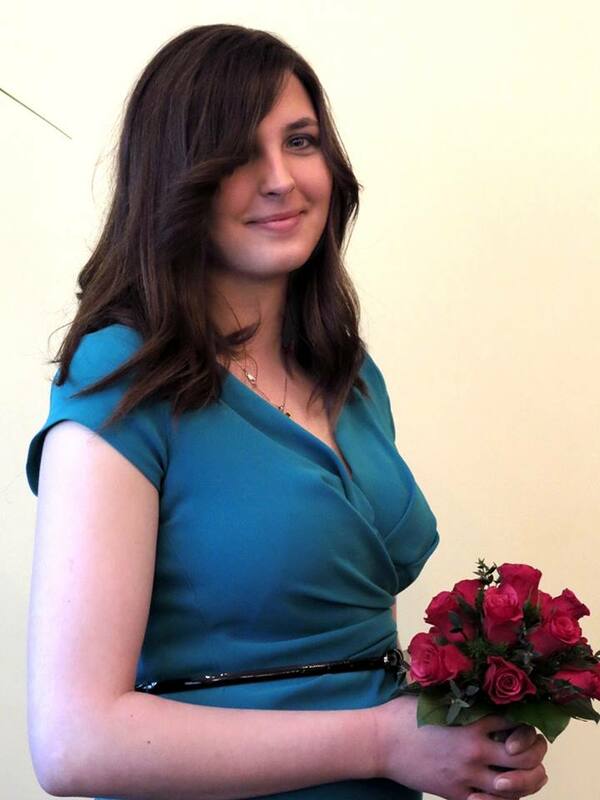 Because on the day of the accident Agnieszka was over 18 years of age (23), she didn’t have the chance to get specialized help at the ‘Alarm Clock’ clinic. She was meeting all the criteria except for her age ... Disappointment, bitterness and grief caused us almost physical pain. Aga spent weeks in hospitals, and because POLAND DOESN’T HAVE A CENTRE WHICH DEALS WITH WAKING UP ADULTS, at the beginning of February 2016, my sister returned to her family home. Since then, the overall responsibility for her life and health rests on us, her immediate family. 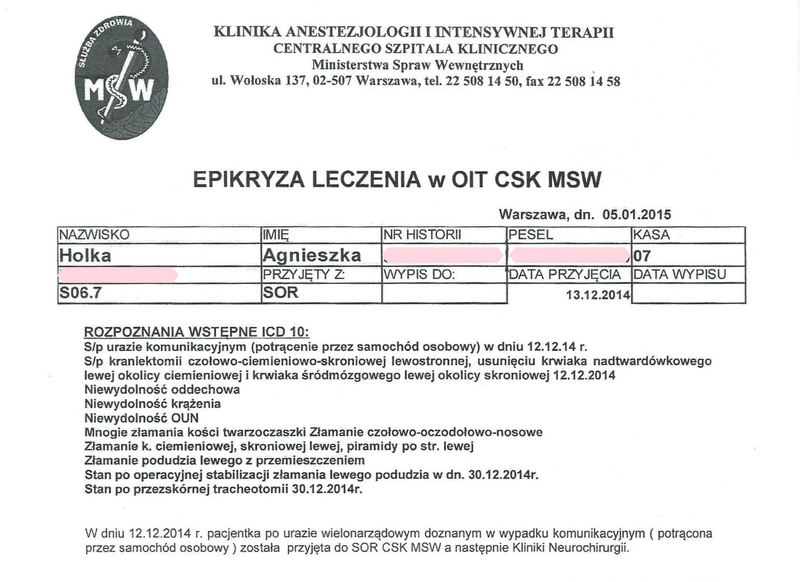 Thanks to my parents’ determination, as well as good test results that we owe to the ongoing intensive rehabilitation, Agnieszka has qualified for the FIRST IN POLAND OPERATIONS OF IMPLANTATION OF SPINAL CORD STIMULATORS. 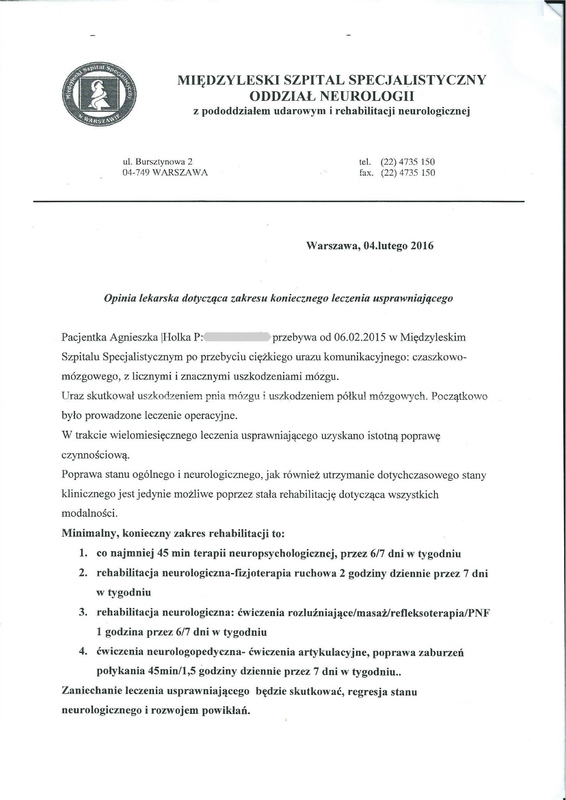 The operation took place on 17.05.2016 in Olsztyn. It was performed by a world-class neurosurgeon from Japan - prof. Isao Morita, who thanks to this innovative method, has managed to awake from coma several hundred people. So far, only 4 people in Poland were given that chance. Among them, our Aga. Until now, those kind of surgeries were only performed in Japan. The treatment ameliorates patients’ state in about 60 % of cases (!!!) The surgery consisted of opening of the spinal canal, and implanting an electrode above the spinal dura mater. To this electrode an electric current flows from a stimulator that has been placed on the torso. Every 15 minutes the stimulator sends a "portion of the current" to the brain, which previously lacked it. In this way, previous deficits of impulses are being replenished, which translates to better functioning of the brain and improvement of patients' health. Brain stimulation is supposed to consequently lead to contact between the surroundings and people that have so far been in a minimal consciousness state. We love her very much and we miss being able to communicate with her, we miss her positive energy, enthusiasm, optimism ... that’s why we will do everything in our power for her to come back to us. Now, a direct threat to life has passed, but Aga is stuck behind a thick milky glass, separating her from the world. Additional motivation to fight, to overcome this barrier, are giving us opinions of doctors and therapists who claim that Agnieszka has great neurological potential. This means that with hard (read: very hard, almost titanic, and unfortunately expensive) work and commitment of many people, she has a chance to improve her current state!! Rehabilitation, in a minimal necessary extent, takes about 4 hours a day. Abandonment of rehabilitation treatment will result in regression of the neurological status and development of complications, that’s why the continuity of rehabilitation is so important. That’s why, YOUR help is so important. 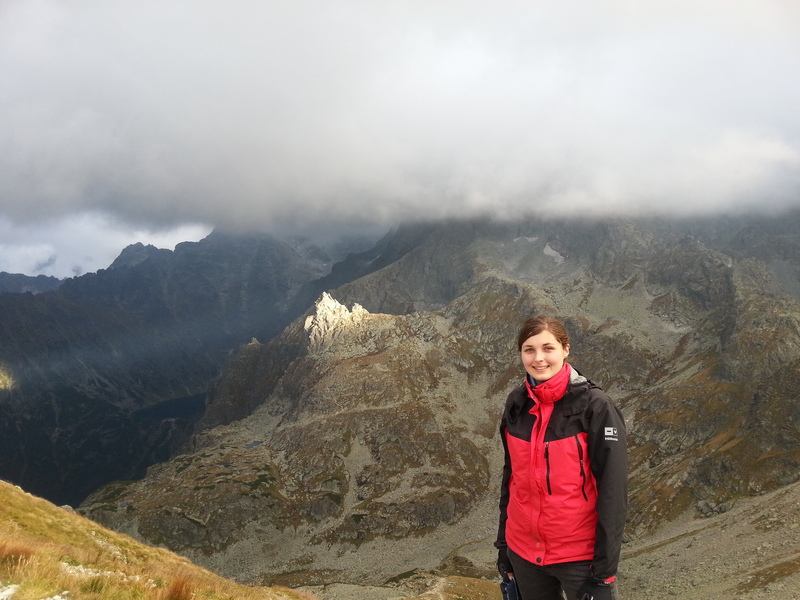 How can you help Agnieszka? Share this information with as many people with good hearts as you can. The more people know, the better are Agnieszka’s chances to return to health. Thank you for your commitment. Together we have a great power! You can also support us by spreading the action among your friends, in your neighborhoodyou’re your workplace, wherever comes to your mind that you can find a good soul.